Mrs. Erlinda Alforque Cunningham age 79, of Hendersonville, TN, passed away on Tuesday, February 5, 2019. 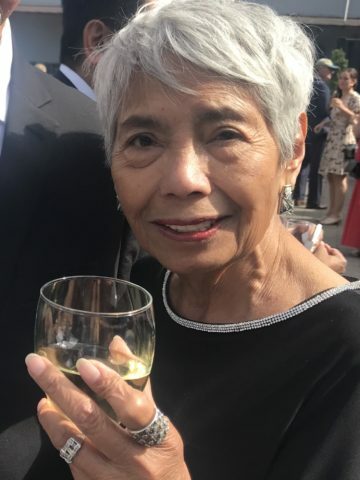 Linda was born in Cebu, Philippines on June 27, 1939, the daughter of the late Juan Alforque and Socorro Iriarte(Jesus). She was a parishioner at Our Lady of the Lake Catholic Church. Linda retired as a Vice President of Delta Life insurance company. She lived in many different places, one of the places she loved was Slidell, LA but in every place she lived, she always made sure that it was large enough to call home for her large family. She lived for the family gatherings in her home. Linda was an avid reader, even studied Shakespeare and the classics, and enjoyed many hobbies, shopping, knitting, collecting art, cooking her ‘Humble meals’, entertaining and driving the countryside. In addition to her parents, Linda was preceded in death by her son, Christian Dava. Survived by her husband, Jim Cunningham, to whom she was married on June 26, 1985; six children, Dexter (Alicia) Dava, Lemuel (Joy) Dava, Harold (Monica) Dava, Josie (Tom) McGee, Scott (Debbi) Cunningham, and Donald (Susan) Cunningham and her pride and joy, 10 grandchildren; Jessica, Dori, Alexa(Jack), Blake, Keenan, Michael, Cameron, Mya, Rush; brother, Rafael Iriarte; and two sisters, Valerie (Robert) Rosenthal and Inday Farol and nephews Jeremiah(Lizzy), Kenny and niece, Justine. Visitation will be held from 10:00 a.m. to 12 noon, with A Celebration of Life and Funeral Mass starting at 12 noon, February 8, 2019 at Our Lady of the Lake Catholic Church. In lieu of flowers the family respectfully requests memorial contributions be made to St. Jude Children’s Research Hospital, 501 St. Jude Place, Memphis, TN 38105. Jim, we offer our condolences and prayers for you and your family. Erlinda leaves an permanent impression in our lives. We share your feelings of loss but, remember and cherish the time we spent with both of you. “What one leaves behind is not what is engraved in stone monuments, but what is woven into the lives of others”. Erlinda was a fine lady who loved her family deeply. She will be missed by many. May her memories bring you comfort. Thx Denny & Sue, appreciate the sentiment. I really don’t know what to say. But I do know she will be missed by myself , my family and all of the people she has touched with her energetic smile, her “cool clothes” and her Sunday hugs at church. Also, Jim, both of you have been great friends to me and I appreciate it! Our condolences go to the family and it is a great loss in our lives! We were blessed to call her Friend and enjoy so many times together! Our prayers and love to the family! We are so sorry to hear of your loss, she was such a sweet and kind person. May your wonderful memories together comfort you. It was a beautiful ceremony for a beautiful woman! What an amazing impact she made on this world and my family! She will be missed. Dear Cunningham Family; Greg and I are saddened by the loss of your loved one. We both know it’s one of the hardest things in life to experience. She is finally home now, may all your wonderful memories be blessed.